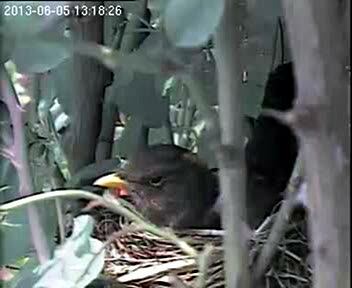 Notes: Live video from a blackbird nest in Clarke Brunt's garden. I don't guarantee that the video will remain online, or will be working at any given time. I have limited the number of people who can view at the same time, so try later if it doesn't work. I might reduce the image size or quality further if too much bandwidth is being used. I have also limited how long you can watch the video for - should be about 5 minutes, after which it will stop updating. You can stop and start again to watch more, but don't leave the live video running for extended periods, especially if you're not actually watching it. You can close it (and return to the static image) without leaving the page by clicking the [x] at top-right of the video, or by hitting <Esc> (while over the video). Hitting ? (while over the video) will display keyboard commands. Clicking the video will pause or re-start it. Note that you cannot seek forwards or backwards in the live video - attempts to do so will likely result in it playing from the time at which you started watching - the only way (that I know) to get back to 'real time' is to close the video (esc or [x] again) and re-start (or of course re-load the page). There is supposed to be audio as well as video. You might need Flash Player installed in your browser, although the browser might be able to play the HTML5 video without it. Offline, as the birds have now gone. 2013-August-2 As I had come to expect, as it was taking too long, the egg hasn't hatched and the birds finally abandoned it, so I've taken the video offline. The are a number of young blackbirds in the garden, getting quite tame as they come from food - possibly from the earlier clutch, or from nests in other nearby gardens. 2013-July-29 I'm not sure what's going on. There's just one egg in the nest (I looked yesterday, and again today). So at least one egg has disappeared, and if this egg is one of those laid around 2013-July-11, then it's taking a while to hatch. The female is still sitting most of the time, and the male visits as well. 2013-July-21 There are two eggs in the latest clutch, so with the first being laid around 2013-July-11, they should hatch any day now. 2013-July-12 The adult blackbirds have been returning to the nest occasionally for nearly a week, sometimes with more nesting material. The female sat on the nest overnight two nights ago, but there were still no eggs. I checked again this morning, and there is now one egg. 2013-June-24 The chicks are sometimes visible sticking their heads up when the parents bring food. I looked in the nest from my ladder yesterday - there are three chicks. 2013-June-16 Female blackbird still sitting; male visiting occasionally but doesn't seem to actually sit on the eggs. I assume they haven't hatched yet. 2013-June-5 Blackbirds nearly always nest in this climbing rose. This year, they built a nest earlier than usual in the season, when there wasn't much foliage for cover - they abandoned it with two eggs shortly afterwards. This new nest is the 2nd attempt, built in the last few days (obviously I can't be certain it's the same birds).